Something has clearly gone afoul here. You try rebooting, and it doesn’t help. That’s when it’s time to refresh your receiver. DIRECTV uses “conditional access” technology to make sure you’re getting all the channels you pay for, and none of the channels you don’t. This information is coded into your receiver, and it’s dependent on that smart card in there as well. How is it dependent? Well, that’s a secret. I’m not trying to be a jerk, it’s more like the exact details are known to very few people because DIRECTV wants to discourage hacking. Plain and simple, there’s a list of channels the receiver thinks you get. It can get corrupt, and it’s actually re-downloaded from the satellite all the time. There’s a special stream of satellite data dedicated to nothing but telling every receiver in the country what kind of programming it gets. In normal use, a receiver pulls this information every few days and if you tune to a channel you haven’t tuned to in a while, (or one it thinks you don’t get) the receiver looks right away. That’s kind of a misnomer since as best as anyone can tell, doing this doesn’t force the receiver to do anything until you actually make it look at the stream by tuning into a channel you don’t currently get. What you’re really doing is refreshing the software stream, but the effect is that the list of channels you actually get is refreshed, eventually. It’s just not a direct, push-button kind of thing. Whatever you call it, it’s ridiculously easy to do. 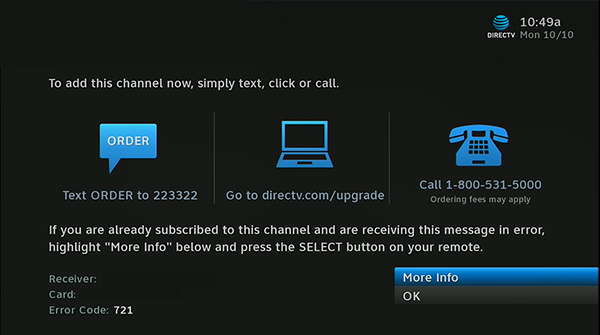 You’ll need an account at DIRECTV.com, but once you have that, go to directv.com/721 (that’s the error number), There’s a nice little audio presentation and a whole lot of troubleshooting text. Where it says “Solution 2” you’ll see where you can click through to your equipment page and refresh a receiver. Refreshing a receiver takes about 5 minutes to execute and it usually fixes the problem. If it doesn’t, give the fine folks at Solid Signal a call at 877.312.4547 and we’ll get you on the line with a representative who can see what’s going on with your account and fix things from there. Is your DIRECTV receiver noisy?